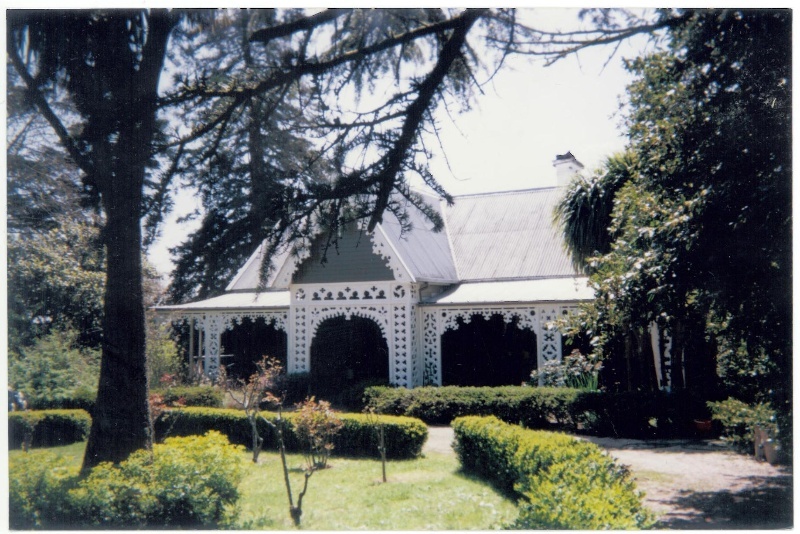 Ballantrae at Buninyong was built in 1857. The land on which the house stands was first alienated from the Crown by Patricius William Welsh on 24th February 1854. Welsh, the son of a Dublin doctor, was a merchant and land owner in early Melbourne and Geelong. He is recorded as becoming insolvent in 1843 but regained his fortune during the gold rushes as a gold merchant with extensive property interests. The house is depicted in a photograph dated 1859. In 1860 the wealthy Western District pastoralist Dugald McPherson had a charge over it for ₤300. Welsh sold the property early in 1863 to his tenant Thomas Christopher Coates. Coates, originally from Westmoreland, married in Buninyong in July 1863. The house remained in the Coates family until 1944, when it was purchased by Mrs Irene Lippiart, but the surviving Miss Coates lived in the house for a further fifteen years. The house is composed of two cross-gable roofs with a central porch over the entry. It forms a perfect square. It is surrounded by a verandah on all four sides. The rear (northern) verandah has been filled in on the eastern side. The principal roofs were originally clad in hardwood shingles which are still in place, corrugated galvanised iron having been placed over them by 1878. The verandah was clad in awning style with battens over. This remains in place save for the northern verandah, which was clad in straight sheets of corrugated galvanised iron in the 1930s. The house is clad with square-edged hardwood weatherboards on the sides and rear. The front is clad in block patterned boarding. The original fenestration consists entirely of full height doors with the upper part glazed in nine panes. By far the most dramatic parts of the exterior are the elaborately carved Gothic barge boards, the verandah valances and pilaster supports. These are carved from Baltic pine 4 cm thick and are three-dimensional. The Gothic barge boards are from a book of patterns by Pugin. Each of the gables has a finial, the one at the apex of the porch being the most elaborate. The exterior of the house is substantially intact, although some of the decoration has been removed from the side verandahs. Internally the house consists of a ground floor, attic and basement. The attic was opened up in 1928 and was reached then by a ladder. On the ground floor there are four rooms, each measuring 15 ft x 19 ft. One of these, the present kitchen, was originally two bedrooms but the other rooms are original, a replacement ceiling having been put in the main bedroom in 1981. The two front rooms have coved ceilings, original deep skirtings and glazed finger panels on the doors. The drawing room retains its original frieze and cornice paint work and the gilded pelmets. The present stair serving the attics was installed in 1981. Stairs lead to the basement level, which is constructed from rubble-filled stone piers. Stone piers each 40 ft in length provide the foundation for the whole house. Piers run lengthwise to support the hall walls, and a cross pier midway supports the flooring joists of the drawing and sitting rooms. In the basement section the stone walls are rendered in plaster internally and partially in cement externally. The original kitchen is intact, as is the maid's room, both of which have fireplaces. The middle room, originally a scullery, now houses storage cupboards. The flooring is of a more recent slate. Ballantrae is historically and architecturally significant to the State of Victoria. 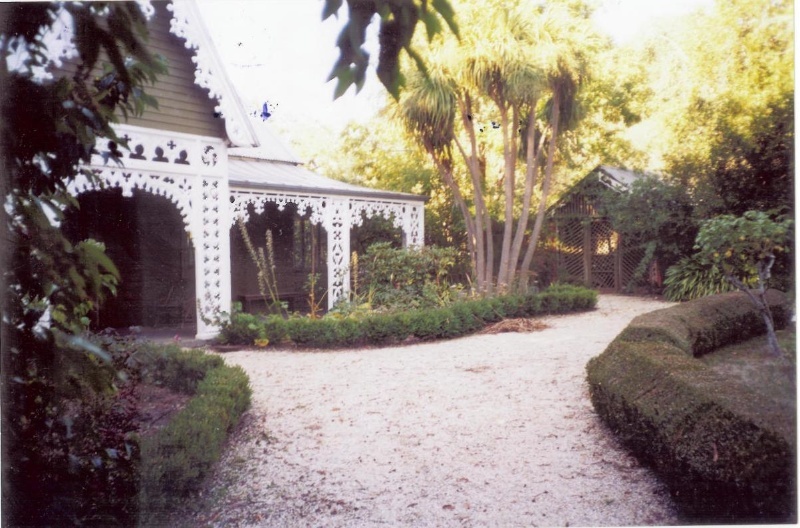 Ballantrae is of historical significance as an example of a residence built by a prominent merchant who made his fortune during the gold rushes. Ballantrae is of architectural significance as an exceptional example of a Picturesque Gothic Revival house from the mid-nineteenth century and is especially notable for its extensive and elaborate timber carving. As Executive Director for the purpose of the Heritage Act 1995, I give notice under section 46 that the Victorian Heritage Register is amended by including the Heritage Register Number 0551 in the category described as Heritage Place. 1. All of the structure shown as B1, being the house, on Diagram 551 held by the Executive Director. 2. 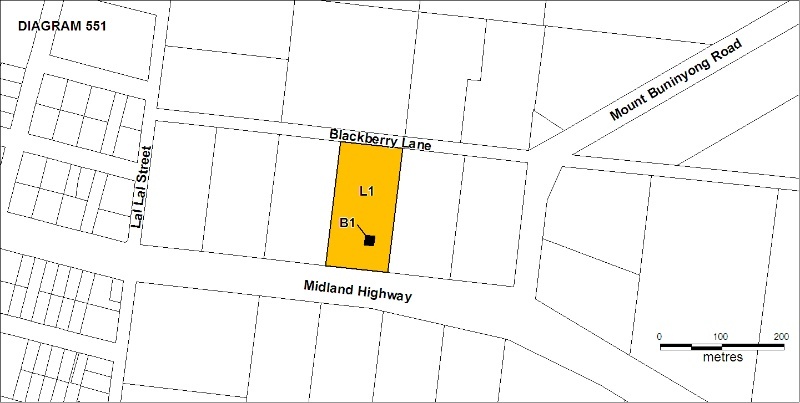 All of the land shown as L1 on Diagram 551 held by the Executive Director being all of the land described in Memorial Book 805 No. 298. 3. All of the gardens, trees and driveways included in the land shown as L1 on Diagram 551 held by the Executive Director. This 1857 Picturesque Gothic Revival house is especially notable for its extensive and elaborate exterior timber carving. It is a significant example of a residence built by a prominent merchant who made his fortune during the gold rushes. It is important that any proposed changes to the place are considered on the basis of clearly defined plans and must be carried out in a manner which prevents damage to the significant fabric of the registered place. It is recommended that before any proposed changes are undertaken the Conservation Management Plan [CMP] for the building be consulted. It is recommended that the Conservation Management Plan be extended to include an appendix covering the objects.